The administration has added conditions for a departure from Syria that include defeating the last isis holdouts—“We won’t be finally pulled out until isis is gone,” Trump said—and protecting U.S. allies such as the Syrian Kurds. The U.S. National-Security Adviser John Bolton claimed that “the timetable flows from the policy decisions that we need to implement.” If the administration applies these benchmarks strictly, then even the beginning of the end in Syria recedes into the Levant horizon. isis, or its successor groups, will never be “gone.” isis militants can always abandon the physical caliphate and go underground, rebranding themselves as insurgents or terrorists. As for the Syrian Kurds, they will require protection indefinitely. They are threatened by two powerful enemies: Turkey, which considers Kurdish forces to essentially be terrorists, and Bashar al-Assad’s regime. If the conditions for a U.S. exit extend to checking Iranian influence in Syria or defending Israel, then withdrawal becomes even more fanciful. Tehran saved Assad’s regime at a cost of billions of dollars and is not about to leave. Even if Trump fudges these benchmarks, or abandons them entirely, it’s exceedingly difficult to physically bring troops home. The process of leaving is known as “retrograde,” and is a logistical nightmare. The military has to box up and ship out a “Little America” of bases, Humvees, air conditioners, and even fast-food joints. Every gun and every bullet needs to be packed away, given to allies, or destroyed, to make sure they don’t fall into enemy hands. Removing one brigade of 2,000 to 5,000 soldiers from a combat zone can take weeks or months. A larger footprint can mean months or years. In Syria and Afghanistan, U.S. forces have to leave through forbidding terrain in an active war zone, without a nearby port. he kicker is that even if American troops do come home in a reasonably timely fashion, they will likely return before long. Recent U.S. campaigns in the Middle East have operated like a revolving door. In a globalized world, what happens in the Middle East affects U.S. interests and values. Recent presidents were all loathe to engage in prolonged conflicts in the region, but they were even less willing to—as they saw it—risk American security or lose a war. After the U.S. invasion of Iraq in 2003, President George W. Bush was eager to avoid nation building and pursued an exit strategy known as “leave to win” based on training Iraqi security forces and reducing U.S. troop levels as speedily as possible. When violence worsened, however, Bush ordered tens of thousands of reinforcements to Iraq as part of the “surge” strategy. President Barack Obama removed U.S. combat forces from Iraq in 2011 but sent troops back in 2014 to combat isis. In an interview with Obama, The Atlantic’s Jeffrey Goldberg quoted an Al Pacino line from The Godfather: Part III: “Just when I thought I was out—” Before Goldberg could finish, Obama completed the quote: “—it pulls you back in.” War, like organized crime, has a magnetic draw. 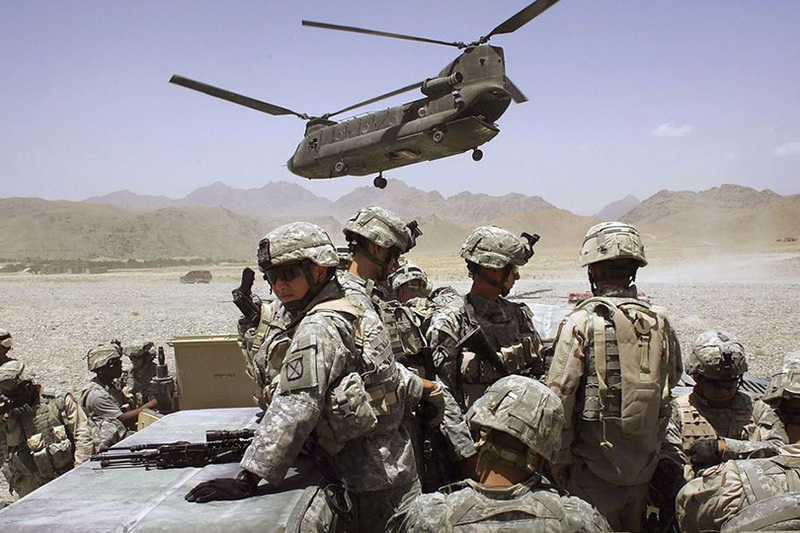 Obama withdrew U.S. troops from Afghanistan but kept in place a successor force of about 10,000. In 2017, after the Taliban made military gains, Trump agreed to send 3,000 more troops to Afghanistan, bringing the total to around 14,000. By removing 7,000 soldiers, Trump is half exiting from a war the United States already supposedly exited. Given this history, it’s easy to imagine how the fight against a rebooted isis or a strengthened Taliban will lead U.S. forces once more unto the breach. Is Trump willing to see the Taliban recapture Kabul, with people escaping from rooftops by helicopter? The United States is not going to leave Syria and Afghanistan as speedily as the hawks fear or the doves hope. The departure of U.S. soldiers will be so slow that there may be time for the next war to begin before they reach the exit. “After many years,” Trump said of U.S. troops, “they are coming home.” The homecoming could, indeed, take many years.